“The Misanthrope,” the wanted poster reads. It’s a nickname that infamous outlaw Buster Scruggs (Tim Blake Nelson) disputes. Introduced on horseback, strumming a guitar and crooning a song to the canyons, he certainly seems like a jolly enough fellow—more of an eccentric dandy, nonthreatening in his white suit and hat, than a cold-blooded desperado. He kills people, sure, but does he hate them? Joel and Ethan Coen know a thing or two about that particular label. People have been calling them misanthropes for a good chunk of their career, returning always to the charge that these sibling filmmakers “hate their characters,” because why else would they subject them to such indignities and torments and ignoble ends? The Ballad Of Buster Scruggs (Grade: B), the Coens’ new Western-themed anthology film, probably won’t change anyone’s mind on that matter; it squeezes plenty of laughs out of the often-fatal foibles of its ensemble, including the literal gallows humor of its best punchline. What comes through clearer, though, is the duo’s increasingly common vision of the universe as fundamentally uncaring. Is it misanthropy or just bone-deep pessimism to locate some grim comedy in the senseless barbarism of the Old West, to say nothing of the world since? Though his name’s in the title, Buster Scruggs isn’t in much of The Ballad Of Buster Scruggs. He appears only in the first of the film’s six unconnected vignettes, which turns out also to be the broadest, glibbest, and most savagely funny of the lot: a grotesque vaudeville musical of casual carnage. The Coens’ sick joke here is presenting a corny Western archetype, the singing cowboy, as an unexpectedly unstoppable killing machine, blithely shooting his way through the saloons and across the main street of a one-horse town that makes the collective mistake of underestimating him. The violence is hilarious and discomfiting; a creative execution, recalling the outrageous slapstick of one-time collaborator Sam Raimi, gives way to a perverse drunken singalong, even as the Coens rub our noses in the sobering grisliness of the aftermath. Buster is like Anton Chigurh by way of the Road Runner. He’s also, quite possibly, a proxy for his creators—standing both within and outside of the action, breaking the fourth wall during pauses in his gleeful rampage, having his winking, wiseass fun with the caricatures around him. A whole movie in this gory-goofball mode would be exhausting, and possibly unsustainable. Thankfully, the tone shifts with each new chapter—a point stressed by Nelson during the post-screening press conference at the New York Film Festival, where the Coens also dispelled hearsay that Buster Scruggs was ever conceived as a television series. We have a bank robber (James Franco) who gets in way over his head; an impresario (Liam Neeson) going town to town with an unusual star attraction; a gold prospector (Tom Waits) with an innovative process (an element that recalls another recent Western, The Sisters Brothers); a lonely woman (Zoe Kazan) heading to Oregon in a caravan of covered wagons; and a group of strangers thrust together into a stagecoach, à la the opening act of The Hateful Eight. Like most omnibus projects, the results are something of a mixed bag, though the peerless craftsmanship lends the whole project a certain cohesiveness. Just about every segment has at least one remarkable moment, playing with perspective or duration: a gunslinger surreally inspecting a bullet that’s critically passed through both sides of his ten-gallon hat; a lone cowboy fending off waves of enemy marauders; a direct homage to the creaky, loud-as-hell sound design of the famous opening scene of Once Upon A Time In The West. Not every segment comes together in a satisfying way. In fact, many of them seem all but designed not to. 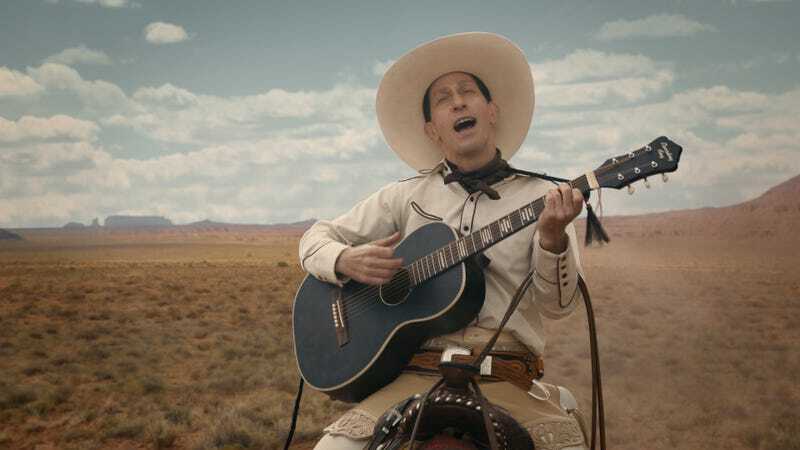 Like No Country For Old Men, which is essentially a Western itself, The Ballad Of Buster Scruggs presents anticlimax as a philosophical position. (It’s telling, in some way, that the episode with the most conventional sense of closure is the one the Coens didn’t dream up entirely themselves—it’s based, however loosely, on a Jack London short story.) Specific genre aside, the format recalls nothing so much as Tales From The Crypt, down to transitional cutaways to a leather-bound book, featuring illustrations that tease events from the pocket-sized dramas to come. But Crypt’s stories unfold in an essentially moral universe, punishing sinners via an almost Old Testament karmic retribution. What goes around doesn’t necessarily come around in Coens country, and if there’s an overarching idea holding The Ballad Of Buster Scruggs together, it’s that very few of us will make our way to a meaningful ending. That’s not misanthropy. Sadly, it may just be realism.